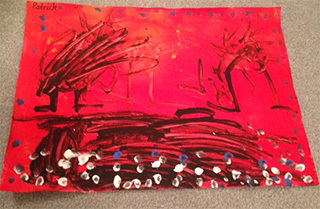 Today we’re going to enjoy the work of my latest feature artist Patrick who was about 4 when he produced these paintings. The first one is free flowing whereas the second painting has been done under guidance. Let’s talk about the free flowing one first and what it tells us about Patrick’s view of the world. The first thing that takes your eye are the white and blue dots which look like they have been made with a round brush. As the dots are concentrated together it would seem they represent a group of something - perhaps flowers. Patrick has observed this in his world- that shapes are repeated in nature and grouped together. He has continued the dots around the painting as a border or these dots might have been done first. Nevertheless he has discovered that the dots can be used for different purposes in a painting. The other shapes in the painting remain unidentified but could be seen as figures of people or perhaps the trunks of trees. Whatever they are, they represent something different to the dots and as discrete shapes help form the composition of the painting. These shapes also give the painting height. The blackness behind the dots definitely represents a background as the dots have been painted over the black which might be suggesting ground. Now let's look at Patrick's guided painting and you will see a very different approach. 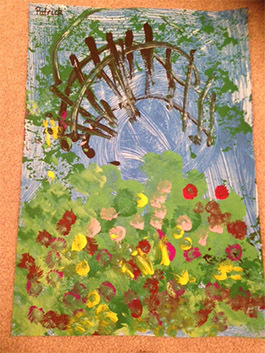 The painting, done under instruction from his kinder teacher, follows in the tradition of Monet painting and shows elements from Monet’s garden at Giverny in France. We can see the bridge, the lily pond, the flowers which are in Monet's garden and painted many times by the great artist. Patrick has no real understanding of Monet's garden but the concepts of a bridge, a pond, flowers are familiar. He has followed an image produced by his teacher and linked the objects in this to other similar images from his own world. He has used his own schemata of the world to understand what he was required to do. We all have “maps” in our head of “our” world built up over the years through experiences. Knowing how to use these mind maps is an essential part of all learning and learning to create an art piece is no exception. But back to Patrick’s painting. We can see that first he was instructed to paint his paper the blue of water. My feeling is that he was then instructed to paint the green of the garden at the bottom of the painting. I think he has used a sponge to get this effect and he was given a dark green and a light green. Following this I think he was instructed to paint the dark green foliage at the top of the painting perhaps using an old stiff brush. Next the Monet bridge was painted in. The effect is so accurate I would suggest his teacher closely guided the painting of the bridge. If Patrick copied the bridge he is remarkable. The only way to find out would be to give him other simple images to copy and see how accurate he was. A child who is particularly artistic would be able to copy an image of a bridge. My adult niece, who is an artist, was able to copy a person's writing at 4 years of age so successfully she could have become a forger! Patrick then completed his painting with his dots for flowers using a brush. As his hand is so firm the brush has splayed out to accidentally create petals. Interestingly, these dots have been produced with more confidence than in the other painting so perhaps the first painting was a practice. The question that arises- is it okay to instruct children to draw in this way? Of course it is. Copying and following instructions are integral to learning and developing creativity. Guided drawing or painting mixed with free expression will teach you child new skills and introduce new ideas. However, there must never be any criticism of the child's accuracy. The experience of copying is valuable but only within the child's capabilities and enjoyment. Thank you Patrick for sharing your paintings with us.